So high the quality of Walking The Cat: The Abbey Road EP - the mini-album recently released by the US-based line-up which goes under the name The Universal Thump - that one can't help but feel let down by its moderate length. High quality when it comes to both the compositional/performing stage and the recording sessions, which were held, in part, at legendary Abbey Road studios, celebrated all over the world thanks to The Beatles' recording sessions. And so, feeling in a fine mood thanks to my listening to the aforementioned EP (interested readers are invited to check my review), I decided to ask Greta Gertler Gold - the musician that together with Adam D Gold is the nucleus of this original ensemble - for an interview. Questions and answers flew via e-mail, last week. As you can easily guess, I'm eager to discuss the new work, but first things first. Would you mind getting me up-to-date about what happened after you released your previous album, also those dates you played in the USA and abroad? Let me think back... We released the album in early 2012. We launched the first single & music video Flora with a "double-Thump" show at Joe's Pub in NYC (our band featuring 2 drummers - Adam and Robert Di Pietro - plus Barney McAll on keys and Jonathan Maron on bass). We then toured Southern USA - I'd never been there before and no one had ever heard of us but we were met with warm welcomes (and tears-of-happiness-inducing fried green tomatoes and BBQ) in New Orleans, Austin, Knoxville, Chapel Hill and other places. It was a great adventure! Then, later that year we did a series of shows at The Living Room in NYC - launching each "Chapter" of the album - and another music video for Darkened Sky - with a different combination of musicians/instruments, culminating in a huge, "whale-of-sound" show with many of the 50 or so musicians/friends who played on the album... Something we could only pull off in NYC. Because this was such a big, long album for us, we decided to promote/tour with it incrementally over a year or two. We continued by touring Australia in 2013 (after we got married there :) We did a series of shows with guest vocalists performing the songs - some of my favorite singers in Sydney - it was a great honor and a lot of fun. And then, back in NYC, we did another "whale of sound" show at Littlefield in Brooklyn. We found out in 2013 that we had won International Music Awards for Best Music Producers and a nomination for Best Concept Album for The Universal Thump. We would have liked to have done more to promote the album, but our budget was tight and didn't allow for as much touring as we'd hoped for. So, we decided to try to combine the recording of our next release with a tour of Europe. I saw that, once again, you financed the new work via a Kickstarter campaign. 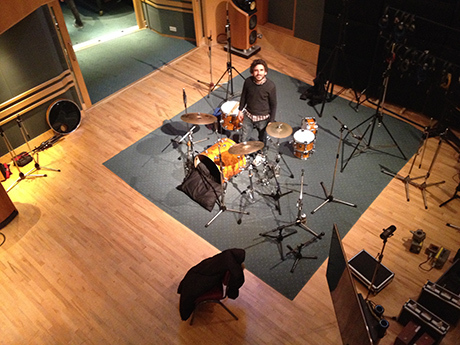 Had you already made up your mind about recording at Abbey Road, or was it an idea that came at a later moment? Originally, I just thought it would be amazing to tour Europe, get the songs sounding really together and alive, and then record somewhere while we were on the road there. An old, Australian friend of mine told me about a band he produced at Abbey Road and suggested we try to record there too. It was with his encouragement that I decided to aim for a day of recording there, if our Kickstarter campaign reached its "stretch" goal. And - amazingly - it did! Please indulge my curiosity here: Did you feel "something magic" in the air upon entering such a famous, historical studio? I definitely felt something magical and alive about recording there. Not only was everything the best quality/highest level, sonically, that I'd ever experienced in a studio... and the engineers all seemed to be ecstatic to be working there... but I felt like the spirit and work of The Beatles somehow came to life for me anew, as I was surrounded by instruments, microphones and other gear that they used to record there. I know that so many other incredible artists have recorded there, but my earliest childhood connections to and love of The Beatles' music was what sprang foremost in my mind - those childhood reactions/impulses suddenly felt re-ignited and relevant. It was incredible to see/hear Adam set up and play drums in the main room, with its enormously high ceiling, mic'd by what seemed like a zillion, beautiful vintage microphones. It felt incredibly special to be there, and we felt so grateful, lucky and inspired. We recorded a 15-minute "Thank You" song in one take for our Kickstarter Backers, where I sang all of their names (and their pets names) in Studio 3 and Adam played an incredibly rocking drum part! I see that you worked with Gordon Davidson and Greg McAllister. Would you mind painting a little picture of those sessions for me? Gordon is an amazing, extremely friendly, creative, accommodating, hilarious engineer with a thick Scottish accent - and Greg was his amazing assistant! The raw sounds Gordon got were incredible - the best I've ever heard. Upon arrival, I was expecting a small studio with an upright piano. 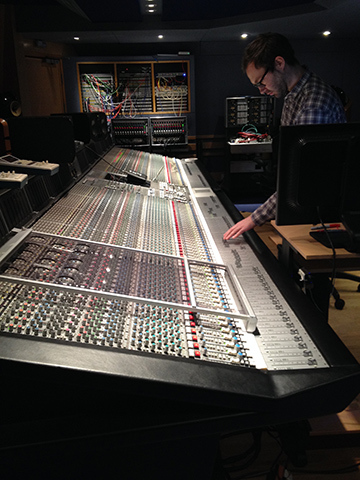 But Studio 3 (the smallest of the 3 there) is HUGE, and has the biggest SSL console I've ever seen in my life. (They mix a lot of orchestral scores there for film & TV these days, apparently.) 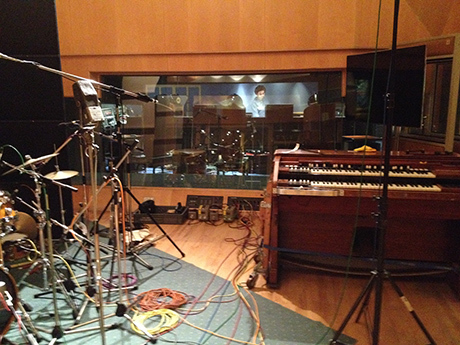 I had the choice of recording on either a magnificent Steinway or Bosendorfer grand. (I chose the Bosendorfer.) Gordon and Greg seemed completely enchanted with Abbey Road and excitedly gave us a tour of Studios 1 & 2, as well as working with us in Studio 3. They were basically geeking out on the studio as much as we were, on our first visit there, even though they've been working there for a while. Gordon quickly apologized that the mellotron wasn't there that day "because Paul was borrowing it from the studio". And he told us many anecdotes about the gear and instruments. I was pretty excited that they let me play the Lady Madonna piano in Studio 2. Studios 2 & 3 seemed so familiar, as they are basically the same as they were in the 1960s. I'm curious to know if the studio atmosphere made you aware of new possibilities in both arranging and timbre when dealing with those compositions you had brought with you. When we were preparing to overdub and edit the tracks, we made sure to keep all of the raw sounds from the studio as "dry" and pure as possible, for as long as we could until we mixed the EP. Back in Brooklyn, in our home studio, I'd never heard such present drum sounds coming out of our speakers. We tried not to mess with that too much. Of course, it's not my intention to undervalue the work of those who did additional work in NYC, and those who mixed and mastered the finished product, which I see has a quite remarkable dynamic range. Talk about this side of the work. Is there a unifying theme to the lyrics? The lyrics are all very much related to the theme of "home", although I wasn't conscious of that when I was writing the songs. Unifying everything is our love for our cat, Minke, who inspired the title track. People I have talked to showed some surprise about your releasing "just an EP", so I guess I have to ask about the sequel... What's in store for The Universal Thump? Yes, this is the shortest recording I've ever released! But it felt compelling to do so after previously releasing a double-album. 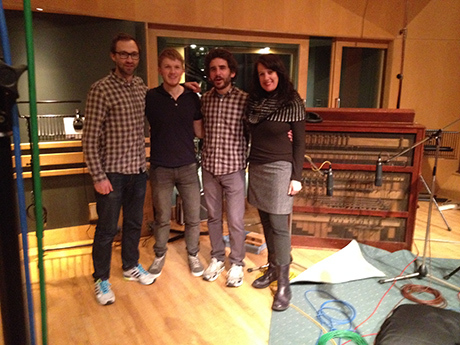 This recording took us just over a year to finish, whereas the previous album took 4 years. We are already working on a "companion" EP and hope to release both of these on vinyl as a 'double-EP' in Europe next year sometime.